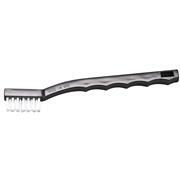 For use in cleaning beakers, jars and cylinders Four rows of black nylon monofilament bristles, twisted in wire and with wooden handle Bristle length portion approximately 6"; maximum diameter 3 1/4"; total length 15 3/4". 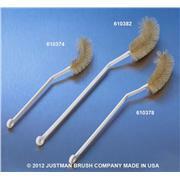 These Test Tube Brushes are engineered to perform a wide variety of cleaning functions. 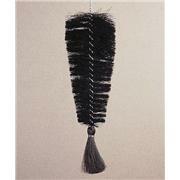 Radial Tip or Double Fan tip Brushes have formed brush sprays at the tip of the brush. 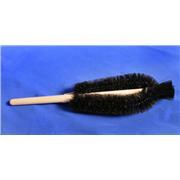 This allows the brush to thoroughly clean the bottom & corners of the bottle or tube, without scratching the glassware. 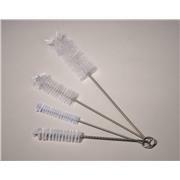 Good quality nylon bristles, mounted in twisted heavy gauge galvanized wire. All brushes feature a radial top. For safe, thorough cleaning of test tubes and narrow mouth glassware Of white animal bristle with tufted end, on sturdy galvanized iron wire 1927G60 brush is suitable for test tubes 12 to 18 mm o.d. 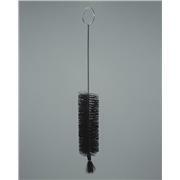 ; 1927K15 brush is suitable for test tubes 18 to 25 mm o.d. 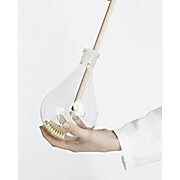 Great for washing bottles, cylinders and large test tubes. 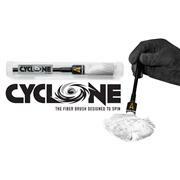 Full radial tip provides thorough cleaning action and prevents the brush from scratching the glassware. 24 or 48 in. 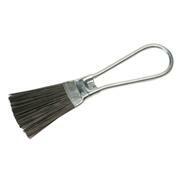 lengths Flexible vinyl brushes fit tubes with 1/2”, 3/4” and 1” diameters. 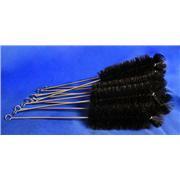 Available in 24” or 48” lengths, brushes are suitable for aquariums, laboratories and other scientific equipment. 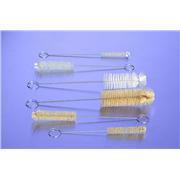 Nylon bristles for cleaning instrument box locks. 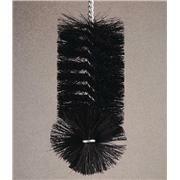 Sturdy, black bristle bottle & cylinder brushes with galvanized handles to prevent rusting. Sold in packages of 12. 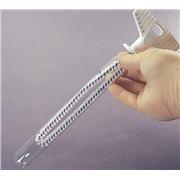 Specially designed for cleaning conical glassware such as pharmacutical graduates and funnels. 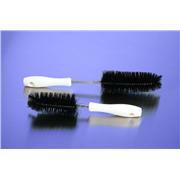 Tapered black bristles have a rounded tip with a double tuft extension for easy removal of residues. 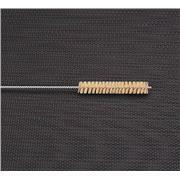 Coarse Sieve Cleaning Brush has an 8-1/2in curved plastic handle with 1-1/2in x 1-3/4in of slanted brass wire bristles—perfect for No.30 and coarser wire cloth in round sieves. 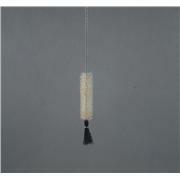 Wooden handle and horsehair bristle. 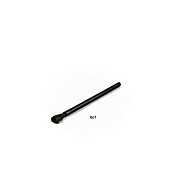 Bristle length is 2-3/4"x 1-1/8"x 3/4" (70mm x 29mm x 19mm), and the overall dimension is 10-1/2" (267mm). 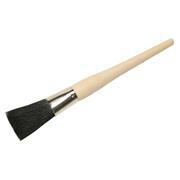 Sturdy, black bristle beaker brush. Sold individually. Available in two sizes. 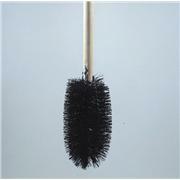 Small Fine Sieve Cleaning Brush has soft, 100% China bristles in round 3/4in (19mm) ferrule that are tapered for use with fine mesh sieves. 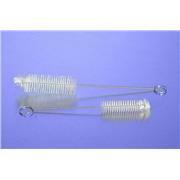 Especially handy for 3in diameter or Precision Electroformed sieves and others of small diameter. 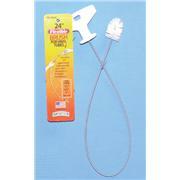 Overall length is 5in (127mm) with wood handle. 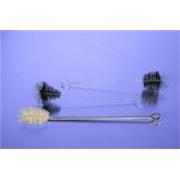 Cleaning brushes for thorough cleaning. Wire loop handle with wire bristles. 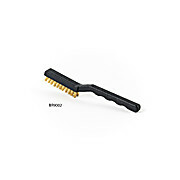 Bristle length is 1-1/2"x 3/4"x 1/8" (38mm x 19mm x 3mm) and the overall dimension is 5-1/2" (140mm). 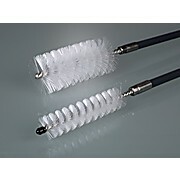 Cylinder and tube brushes with tufted end and plastic handle for glass barrel and tube cleaning. 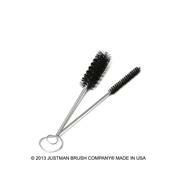 These brushes have stainless steel wire stems and high grade nylon for performance and durability.